Nature Nurture is the lads’ second album and firstly, like I mentioned before, they’re pretty upbeat, well more so than the likes of American Football who I have spent endless amounts of time crying over the lyrics. OKAY STOP RIGHT THERE. When I say ‘upbeat’ I don’t mean happy clappy lets jump on a bouncy castle in unicorn land, although some would say that to be cool, nah their grungey and strong bass-lines are something which draw me in. This is the sort of music where you see in films as the main character wakes up, opening the curtains as the sun burns out your eyes and ‘Arizona Waiting’ starts playing. Bit of air guitar and life suddenly seems fantabbydosy. I like this album. One track which stick out to me as a favourite is ‘Peninsula’. I’ve never been to Seattle but I could imagine this song to be on my tape deck as I cruise looking at the sights (I haven’t even started learning how to drive yet so I should probably do that). On a serious note, ‘Peninsula’ is well composed and fast paced, as it captures my attention and holds it, therefore, I don’t feel the urge to switch it onto the next track. ‘Heather”s opening reminds me of Scott Pilgrim vs The World with the bassy riffs so for that aspect it would definitely get me up on the dance floor at a party (does anyone do that anymore?) plus the harmonies of vocals in the chorus contrast really well with the grungey epicness of the verses. ‘Summer Gurl’ oo. This is definitely a track to bust a few moves to on the beach (Leeds fans will have to travel a long way to do this but it’ll be worth it) a great summer track (yes I know the lyrics mention “Summer’s here” but that’s not important right now) However, roll onto the last track ‘Nature Nurture’ and man, you’re onto a winner. At the start of this track I was thinking “humm just another good tune” but after 30 seconds and the chorus hit in, the hairs on the back of my neck started to lift. The riffs are to die for. Cool, calm, bassy I didn’t want the track to stop. 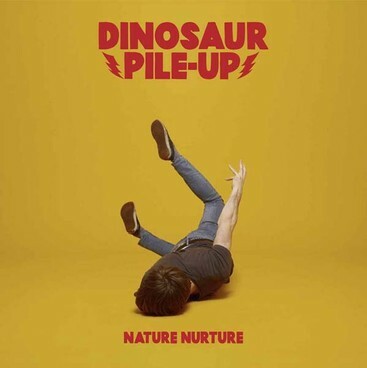 What a perfect ending to this gem of an album, safe to say I am officially a fan of Dinosaur Pile-Up. Posted in reviewsTagged Dinosaur Pile-Up, grunge, Nature NurtureBookmark the permalink.